We are updating our Drop Off Program! Residents and Small Businesses can now take advantage of our drop-off shredding services as a solution to safely shred confidential items on Saturdays. Beginning April 20th, 2019, from 9AM to 1PM EVERY Saturday (excluding certain holidays), you can come to our headquarters at 862 Hersey St., St. Paul, MN 55114 and bring your documents, hard drives, electronic media and pre-purchased #ShredRight4Good shred bags. If you have purchased a shred bag, or a #ShredRight4Good shred bag, you can drop those off in our lobby Monday-Friday from 9AM-2:30PM, in addition to Saturdays. Bring the material you need to be shredded to Shred Right’s St. Paul location for easy, convenient destruction of your private documents and data. Follow the sign below to our back building once you get to our location at 862 Hersey St., St. Paul, MN 55114. Pull your vehicle up to the sign and black awning, and a Shred Right staff member will assist you with your material. You don’t even have to get out of your vehicle! 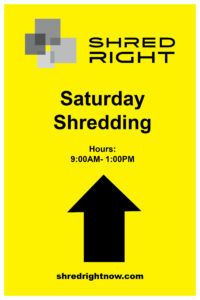 Shred Right’s e-recycling program – is limited to NON-DATA bearing office electronics ONLY. Shred Right is NOT responsible for any data storage devices, such as hard drives, CD’s & memory cards, left with-in items submitted for e-recycling. Examples of acceptable e-waste includes, but not limited to: flat screen monitors, printers, scanners, keyboards, mice, cables, circuit boards, and calculators. Shred Right E-recycling program NO longer accepts CRT/Tube monitors/TVs, projection TVs, or household appliances of any type. Customers requesting help with these type of materials should contact our office directly for additional support. All material shall be destroyed in accordance with NAID standards and practices, based on the appropriated destruction method for material type.